WebVR is relatively in its infancy, and exporting VR games that are built in engines like Unity 5 is not yet a supported feature in these engines. Although Unity supports both WebGL and VR, these can’t be used simultaneously. Luckily, these guys came up with a way to export an indie unity game to WebVR. Whack the virus when you see it! SECVRITY is an indie game that was built using Unity then exported to WebVR. Their game is called SECVRITY, and it apparently drew a lot of people into Mozilla’s booth at the recently held Game Developers Conference. 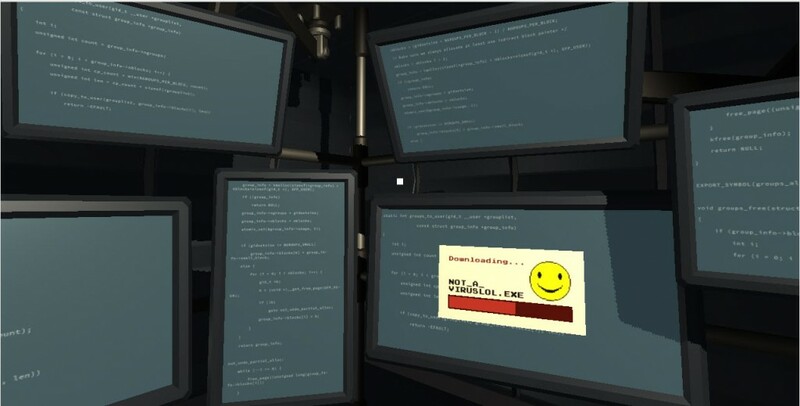 It’s a “Whac-a-Mole” type game where the player is a computer security specialist that neutralizes viruses by clicking the monitor where they appear. The original code they adopted for their project is here, and their Unity-to-WebVR export package can be found here. You can try playing the game on MOZVR.